The major trade-off here is that a higher number means the turns are processed more slowly. The default number of 1,000 is roughly 10x quicker than the number being used in the latest sneak-peek. 1) Other than processing speed, how will a number of 1,000 or 500 differ when playing the game. Will one result in poll #s or results being more volatile? 2) Would there be any reason to make the number 1,000 or 500 or otherwise different in each state? 1. Yes, at 500, you might see more volatility due to the decreased voter resolution in the game. I haven’t noticed any significant differences between 1,000 and 10,000. 2. There’s no way currently to set the number to a different value for each region. The exception to this is if a region has an electorate population which is less than the specified value, in which case that region will have the electorate population number. You can think of it this way. Let’s say Voter Detail is set to 500. For primaries, let’s say there are 5 parties, each with equal voter share of 20%, in a state, say Iowa. 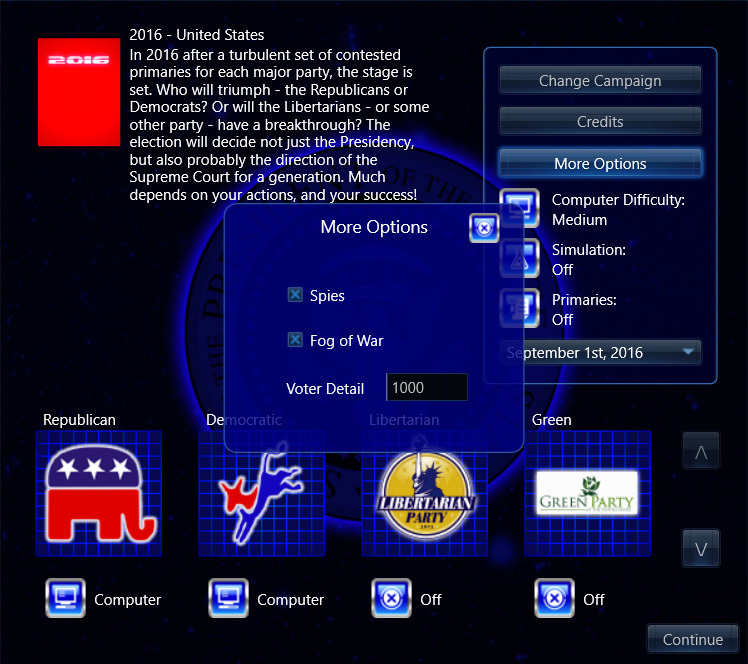 That means for each party’s primaries for Iowa, you have only 100 virtual persons. So any shift in %s will be at least 1% for that party’s primaries in Iowa, in this case. 1% resolution is fine as far as game play goes for most purposes. But now consider that you have one party, say the Greens, with only 2% of the electorate. That means that candidates in the Green party are fighting over only 10 virtual persons, so any % shift within the Green primaries would be at least 10%. At 5,000 people, that drops to 1%. At 10,000, 0.5% resolution for, in this case, the Green party’s primaries that only has 2% of the overall electorate. Ok, that clarifies everything. Thanks! I look forward to this system. Maybe I’m mis-understanding this: I don’t understand why the granularity matters. A shift in 1% is a shift in 1%, whether that’s 1 virtual voter out of 100 or 10 out of 1000. Are you saying that, in the Green primaries above, their percentage can only go up or down in increments of 10%? And the 100 virtual persons effectively means that you have 100 “electors” for that state who are a representative sample of that state’s population? Does that also mean that if a state has 40% Republican voters, that 40 of those “electors” vote Republican? When filling out the party percentages for each state, there is no “independent” option either. Just to clarify what I wrote above, when you go into Regions in campaign editor and select, say 48% Republican 52% Democrat. If you have 100 virtual voters, would there be 48 Republicans and 52 Democrats among them? Since the regions screen only gives political parties to select from, and since in reality the plurality of voters are usually independents, would this system lead to a lack of swing voters? Yes. That’s why the default value for the game is 2,000. This sort of example is where the granularity matters. Otherwise, as you say, it doesn’t really matter. When playing just a general election, a Voter Detail value of even less than 500 would probably be fine, but the game currently restricts the values to 500-10,000. It doesn’t mean they would be the equivalent of registered Republicans or Democrats, just that the initial %s would be such that the electorate would line up 48%R-52%D. To set levels of support, you then specify the ‘undecided-leaning-committed’ numbers. There is a problem in the current game engine, where protracted primaries tends to lead to a polarized electorate, and so few undecided voters come the general election. Fixing this is a top priority.